The results were clear. Nearly 70 percent of voters believe that men have more opportunities. Fifty-seven percent of men and 75 percent of women believe that men have more opportunities for success. Eighty-five percent of millennial women and 83 percent of unmarried women also believe that men have more opportunities for success. This is also true across partisan groups. 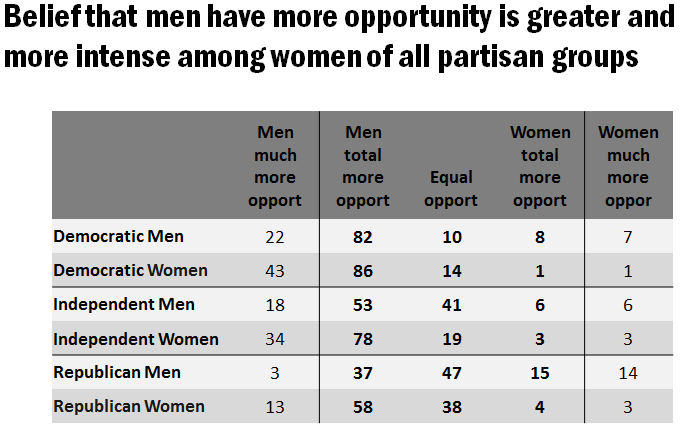 As the chart below indicates, women on both sides of the aisle agree that men have more opportunities. This is not a trend. Women have stated this belief in poll after poll after poll. · 2016 poll: Nearly half of women (45 percent) reported getting paid less than male colleagues for doing the same job or knowing someone who has been paid less than a man. · 2015 poll: Two-thirds of men (68 percent) believe that men and women are paid the same for doing the same job, compared to 53 percent among women. In addition, women were more likely to believe that they do not have the same opportunities as men to succeed in their workplace (65 percent) that their male colleagues do (80 percent). · 2014 poll: More than half (54 percent) of voters believe that women have a harder time getting ahead in the workplace compared to men. Nearly two-thirds of African Americans (65 percent) believe it is harder for women, as do 48 percent of Hispanic voters. Even 44 percent of men believe that women have a harder time, though women are much more convinced of the disparity — 62 percent of women believe it is harder for women. There is no age gap on the measure — more than half of younger and older voters (51 percent and 55 percent) believe women have a tougher time. While it is important to remember that the drive for equal opportunity has no party label, it is also critical to remind ourselves that the need for policies that would help women and their families get ahead are equally shared across all women voters. Policies like paid sick days, paid family and medical leave, equal pay for equal work, college affordability, and access to affordable childcare all resonate with broad majorities of women voters across the political spectrum.